We all know that teachers don't have any extra time. Thank you for being the teachers that make time to teach nutrition to your students. You understand how important this information is to their well being and success in life. We have close to 200 teachers enrolled in the program. This impacts close to 5.000 students and over 7,000 parents. So far this year we have over 4,000 hours of nutrition education being taught in Kings County. 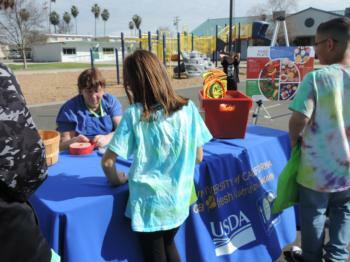 Thank you Hanford Elementary School District for including nutrition education in Health & Safety Days! 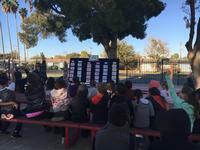 Every 4th, 5th and 6th grade student receives a nutrition presentation, that was 2,000 students this year who played our game. This year's featured game was nutrition jeopardy. 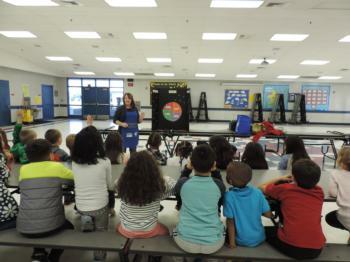 The topics included were all five food groups from MyPlate and fluids (sugary drinks). Students are already asking what we have planned for next year! We try to feature websites that are useful to our clients. Choose My Plate website has so many resources, that we made a page for you to use find the materials you might need. This website addresses, parents, students and young children. Click here for more information on the curriculum for our teachers. Like to play games - here are some nutritious games to play! 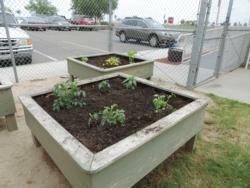 Time that you spend teaching nutrition in the classroom is valuable to the program. Just a few minutes of your time is all that is required! You can also order supplies or book a lesson in the comment box. Click here to find out more! 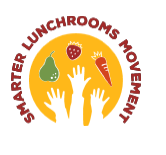 We are working with Cornell University on the Smarter Lunchroom Movement. If your district is interested in learning more about SLM click here. 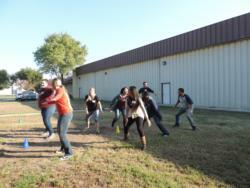 We now have a whole page devoted to our Ready After School Program. Click here to find out more about it! 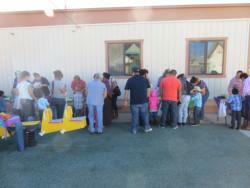 Learn more about the exciting things that are happening at the WHC Child Development Centers.